Berkeley Springs is the site of the oldest spa in the United States. The medicinal springs produce three million gallons of heated water each day. George Washington surveyed here in 1748; in 1756, the area was annexed to the colony of Virginia by Lord Fairfax. In 1776 the town of Bath, as it was known, was founded by the General Assembly of Virginia. James Rumsey was instructed to build five bath houses and other public buildings. The three springs at the center of the town pump a consistent 2000 gallons per minute at 74 degrees Fahrenheit--enough to supply Bath (now Berkeley Springs) and fill a pool nearby. Public baths at Berkeley Springs are now operated by the State of West Virginia. Baths, showers, massages, and heat treatments are available to the public; prices range from $8 to $30 depending on the treatment. The spa is open year-round from Saturdays through Thursdays, 10:00 a.m. to 6 p.m.; Fridays until 9 p.m. from April through October. Reservations are accepted in advance; a deposit is required. 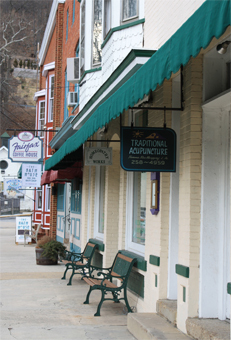 Berkeley Springs has developed into a significant tours center, with antique malls and craft shops near the spa. In-town Bed and Breakfast lodging include Manor Inn, Highlawn Inn, and River House. A number of restaurants are along the main street of Berkeley Springs, but for a great view of the Potomac, travel up to the top of Cacapon Mountain to the "Panorama at the Peak" restaurant. It is located adjacent to the famous National Geographic Scenic Vista on State Route 9.